In addition an essential requirement for down-draw of atmospheric CO2is needed if the other methods prove to be insufficient. “It found the Earth was heading for a tipping point, known as a “hothouse” climate, which could lead to average temperatures up to 5oC higher than pre-industrial temperatures and rises in sea level of between 10 and 60 meters.Lead researcher Professor Will Steffen from the Australian National University (ANU) said at that point much of the earth would be uninhabitable.He explained that if human emissions raised global temperatures to 2oC above pre-industrial temperatures it could trigger earth system processes, or feedbacks, that could then cause further warming.”The real concern is these tipping elements can act like a row of dominoes,” Professor Steffen said.”Once one is pushed over, it pushes Earth towards another.”Professor Steffen said global average temperatures were currently just over 1oC above pre-industrial temperatures and rising at 0.17C each decade.Current efforts ‘unlikely’ to help avoid tipping point”(http://www.abc.net.au/news/2018-08-07/climate-heading-for-tipping-point-and-risk-of-hothouse-earth/10080274). However, according to the Berkeley Earth institute (http://berkeleyearth.org/summary-of-findings/ )global temperature rise over the continents has reached about 1.5oC. “The authors of the study examined 10 feedback processes, some of which could cause “the uncontrollable release” of carbon back into the atmosphere, after it had been stored in the earth.Some of the processes also included permafrost thaw, Amazon rainforest dieback, a reduction of northern hemisphere snow cover, a loss of Arctic summer sea ice, and a reduction of Antarctic sea ice and polar ice sheets.The study did not lay down a timeframe for when such events would begin to occur, but theorized — if the threshold was crossed — it could be within a century or two.”(http://www.abc.net.au/news/2018-08-07/climate-heading-for-tipping-point-and-risk-of-hothouse-earth/10080274). 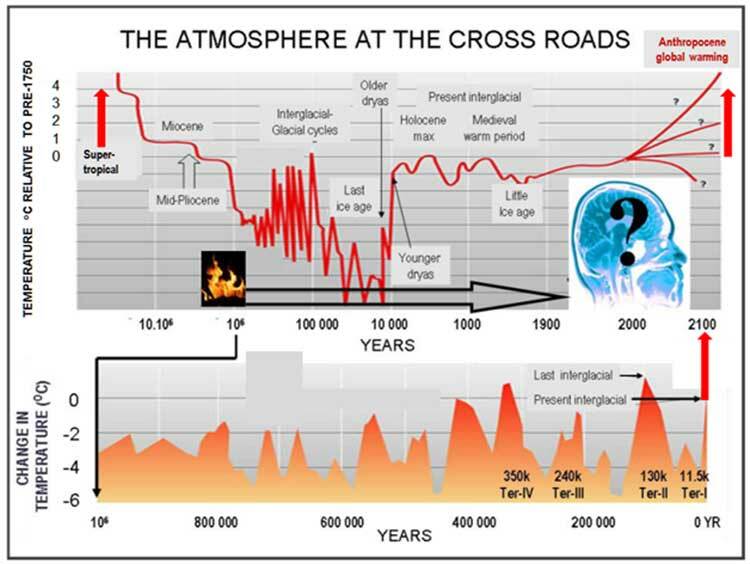 These observations are consistent with those of Professor James Hansen, NASA’s former chief climate scientist, who stated(2012) “Burning all fossil fuels would create a different planet than the one that humanity knows. The palaeoclimate record and ongoing climate change make it clear that the climate system would be pushed beyond tipping points, setting in motion irreversible changes, including ice sheet disintegration with a continually adjusting shoreline, extermination of a substantial fraction of species on the planet, and increasingly devastating regional climate extremes”. Global warming is but one of the great stupidities of human behaviour that is driven by its insatiably acquisitive behaviour. Genetic engineering is another. Nuclear radiation can also be added to the list. Why do humans indulge in such harmful behaviour? Answer: because of inherent weaknesses of the human brain (ironically contrasting with its brilliance). These are addictive greed, (hence Capitalism) and extreme gullibility resulting in emotionally-driven, but illogical, faith. No other life-form seeks more than they need for survival, nor builds monuments to figments of the imagination, which are then endowed with magical powers worshipped.